This year we are honored to be partnering with The Independent Running Retailer Association, and their 700+ stores, for Million Mile Month. One of those stores, Naperville Running Company, has been an all-star participating organization by promoting Million Mile Month to their employees, customers, and the news! We love seeing how different participating organization take the Million Mile Month event and “run with it”! Great interview, Kris Hartner! We thank you for the support and for participating in Million Mile Month 2015! 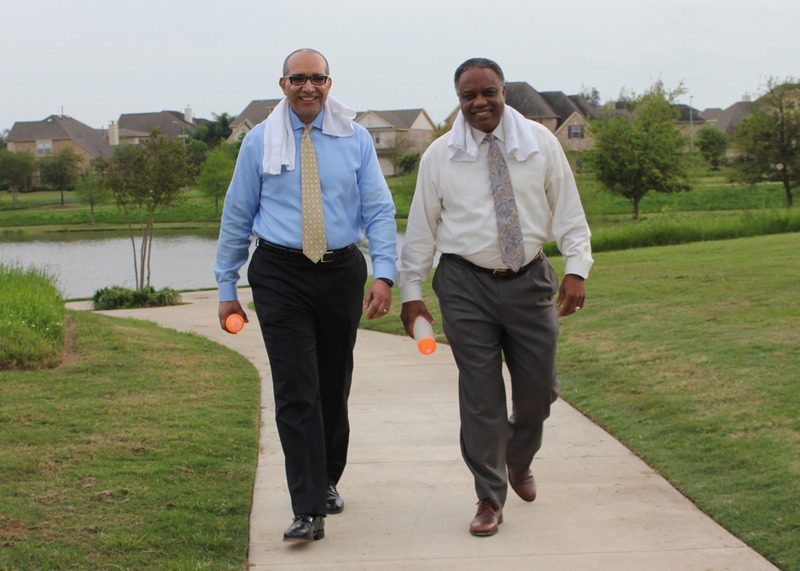 Dr. Charles Dupre, FBISD Superintendent (L) and Dr. Thomas Randle, LCISD Superintendent (R), are leading their school districts in a competition to see which district can log the most miles during Million Mile Month. In 2014, FBISD had the most Million Mile Month registrants out of all participating organizations. This year, they are back with a bigger fitness goal, and brought some friends, LCISD, with them! “Last year, we logged more miles than any other organization, making us the defending champions. This year, my friend and colleague, Dr. Thomas Randle of LCISD, accepted a challenge to try and beat our FBISD team. As superintendent, I know how well our FBISD community can work together on behalf of children. Our strength in teamwork makes Fort Bend ISD the team to beat,” said Dr. Dupre. “We are dedicated to equipping our students with life skills, so Fort Bend ISD is eager to participate in a physical fitness challenge that helps children, reduces stress, and promotes wellness,” said Dr. Dupre. Already nearly 5,000 FBISD staff members, students, parents, and community members have already accepted the challenge to log each mile they walk, run, swim, or bike through April 30. Together, the FBISD community is hoping to log more miles per participant than our neighbors at Lamar Consolidated. Lamar CISD may be new to Million Mile Month this year, but they are bringing their A game! Check out this video they posted last week. Who do you think will win this challenge? “April is here and I have two challenges to tell you about that could help you to feel better and to be a part of something bigger. Bigger and better? Yes, Please! Million Mile Month is a challenge to accomplish one million miles of physical activity, as a community. It takes place every April. You can also participate in MMM community activities throughout the year. Participants can do any event or workout and log their miles in an easy online tracker. The goal is to get more than a million miles logged in April across all participants and groups. It also encourages youth to be more active which is so important! Register (you can register at $15, $25, $50 or pay what you can >$1). All levels include participation in the M3 April challenge, exclusive discounts, entry to Milestone Prize giveaways and M3 Community membership for one year. Complete miles throughout April (run, walk, bike, yoga…whatever you like). 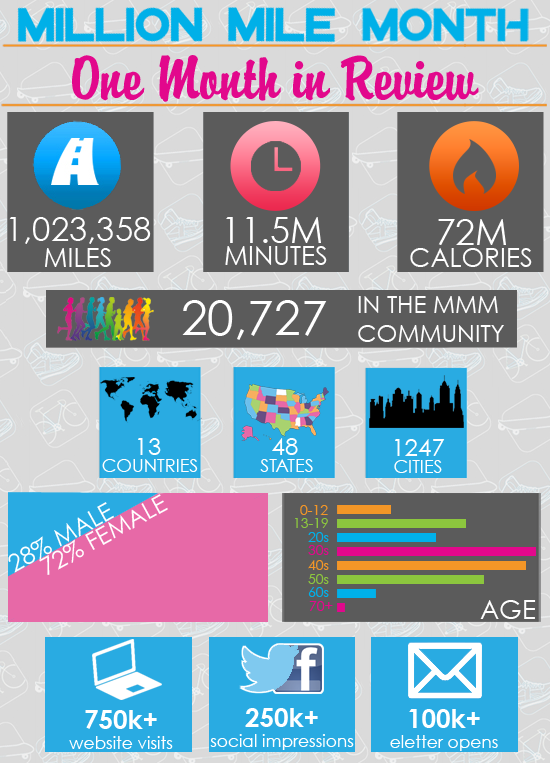 Log your miles to help the entire MMM community reach one million miles in April. You can connect to Fitbit or Garmin or manually enter your miles. Win awesome prizes (bikes, gift cards, fitness trackers and more) just for logging miles. Get recognized for your hard work on the MMM Leaderboards. Stay Connected year-round to become a Fitness Millionaire™. Reduce your risk of heart disease and increase your overall health and wellness. Be a part of a virtual fitness community. Million Mile Month has a two major benefits. First, it helps to improve the health and wellness of participants and participating communities. In addition, Million Mile Month benefits the 501c3 nonprofit Cyberways and Waterways (CW). CW focuses on eliminating heart disease, improving the wellness of all individuals and educating children about personal health and the health of the world around them. Good stuff!